If I’m pulling out the smoker, that thing’s getting a work out. I’m not going to all that trouble to dig it out of the pool house, drag it across the deck to the house, plug it in, prep it etc- if it’s not gonna be worth my while. I try to purposefully plan our meals so that almost the whole shebang can be made in the thing, at relatively the same time. One stop shopping for this busy Mama. Woot woot! Before actually owning a smoker, I thought that they were just meant for meat. Boy, was I wrong! It’s almost embarrassing when I think back on that now. Like, for real. I really equated smoking as a cooking method, with meat. And only meat. How small minded is that? Of course, smoked meats are amazing, and we’ve made sure to churn out our fair share- but how could I have so willfully ignored other foods practically begging to be smoked? After all, smoking is just another method of cooking. Just like my veggies are also great when steamed or grilled, why wouldn’t they be just as yummy- if not even better- when smoked? When smoking, not only do they get fork tender but they get a delicious infusion of wood smoke into every. single. bite. That folks is most assuredly something to write home about! 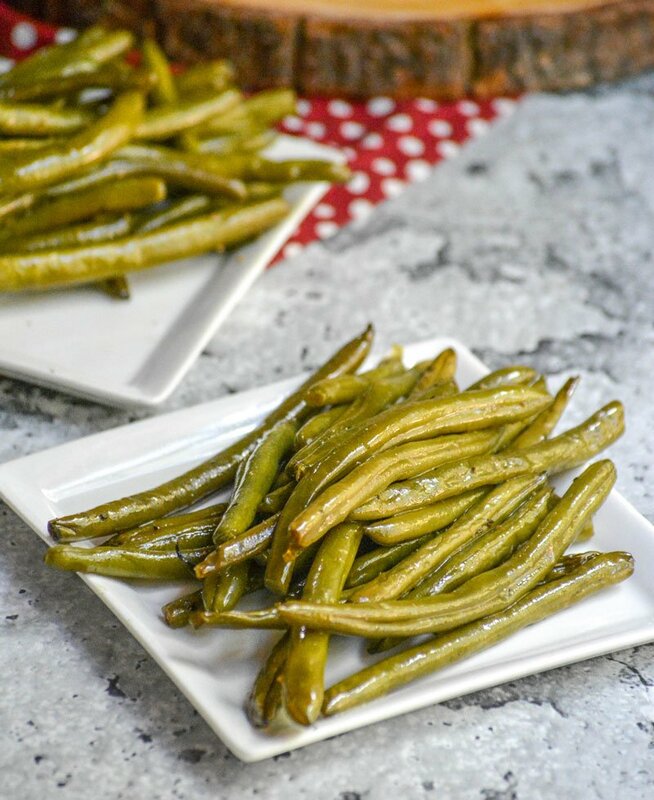 Every time I cook green beans (those not fresh outta the can), I can’t help but remember afternoons spent at the foot of my Grandma’s recliner while I helped trim & snap them, while her favorite soap opera played in the back ground. But those memories also bring to mind Summer when her garden was in full force. I can’t, and won’t, wait a whole season to enjoy one of our families favorite fresh veggies again. So I do shell out for fresh green beans at the store. Sometimes, you just gotta do what you gotta do- especially when Mama is hungry and my kids are only open to a frustratingly short list of green veggies. 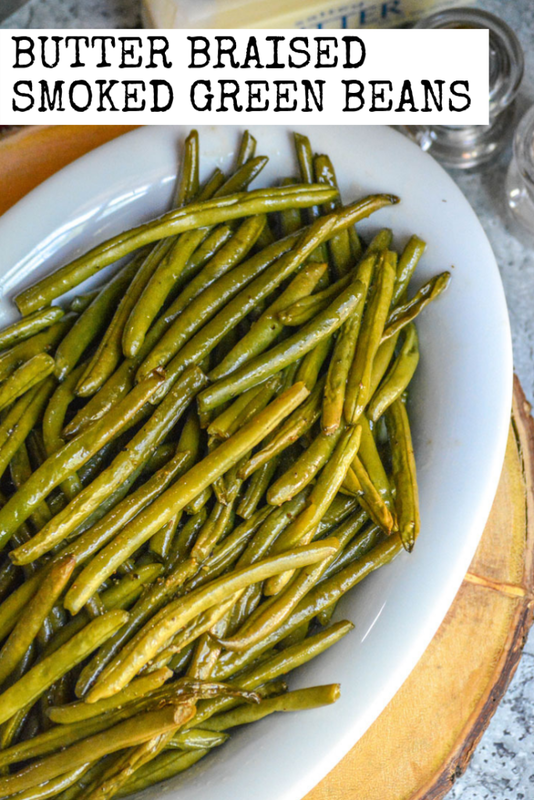 Add the washed, trimmed beans, in a single layer, to a lipped pan. I like to use the aluminum, throw away baking trays. Melted butter is then drizzled over top of the beans, then they’re gently tossed until coated. Season the beans liberally with salt & pepper. While we generally do like to keep things simple, sometimes even the most simple of recipes requires a little dressing up. If you’re feeling that, then I’d suggest adding a dash or garlic powder or lemon pepper seasoning. If that’s still not doing the trick, we will add a dash of Montreal steak seasoning to the mix. Simple, is still nothing to wag your finger at in this recipe though. Preheat your smoker to 275 degrees, and add the beans. Use whatever wood chips you prefer, but our favorite is a blend of hickory, apple, and orange for this recipe. Smoke the beans for 3-4 hours, using tongs to toss them every 30 minutes or so. You want the butter to really marinate in and around them, but you’re also going to need to work quickly as you don’t want to let all the heat out of the smoker completely, kinda like when you have to open the oven during recipe prep. 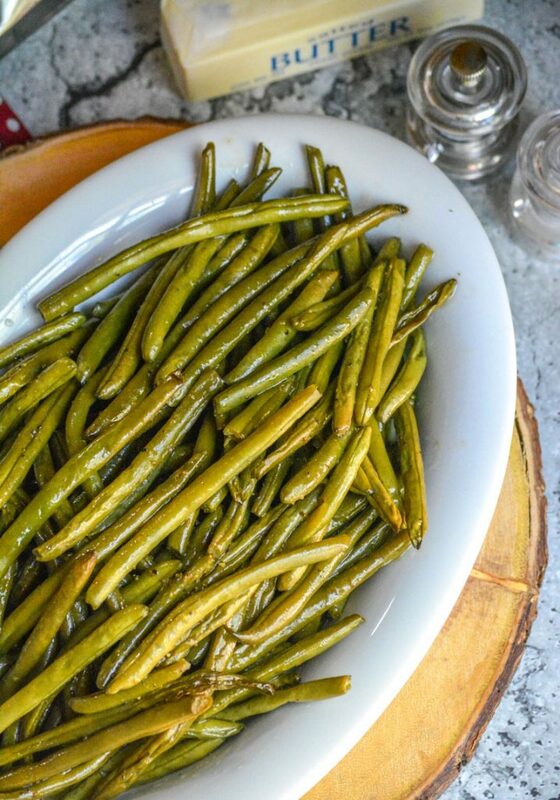 I tend to like my green beans more on the tender side, so tend to stay on the four hour side. They will still be firm and crisp, but also tender. It’s the ideal bean with flavor, and infused with just the right amount of sweet wood smoke. 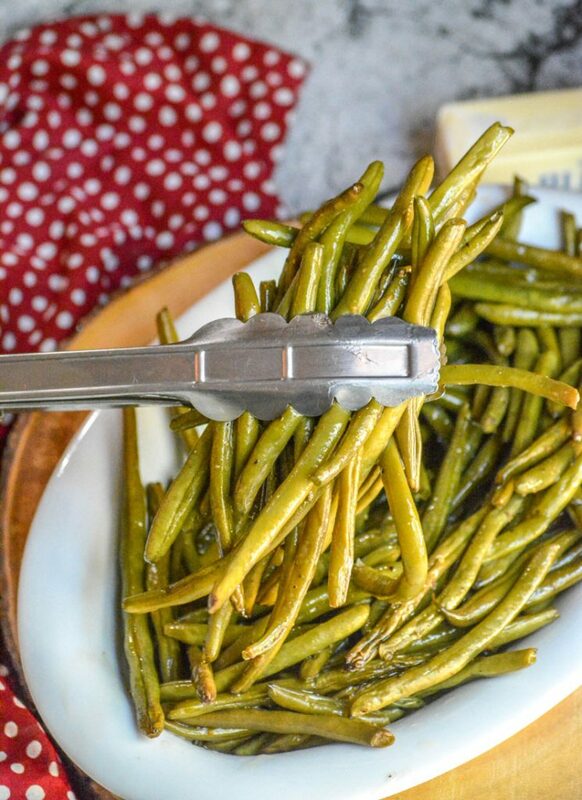 While I love canned green beans, practically help my family survive on them during the week for a solid side dish stand by- they’re not what I prefer. I also like to keep fresh beans on hand. 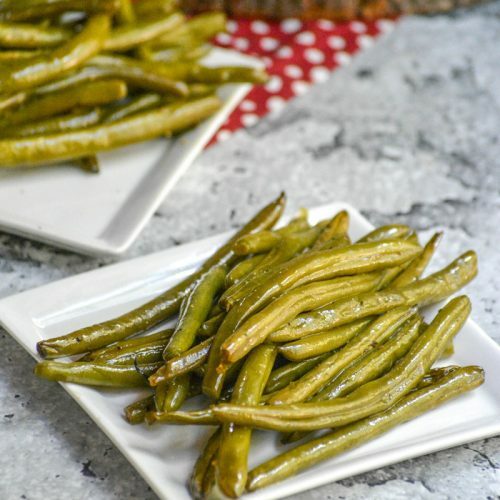 A couple hours in my smoker, a few simple seasonings, and a butter bath- these Butter Braised Smoked Green Beans are the side dish you will love so much, you’re gonna want to plan for it. 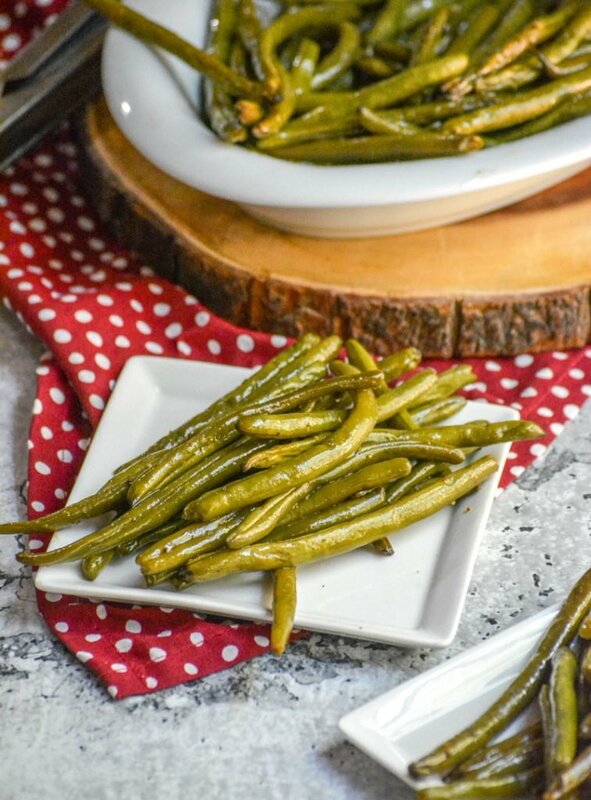 Grilled vegetables are great, but smoked green beans are even better when given a little zest & zing. Add the beans to the tray of a lipped pan, in an even layer. 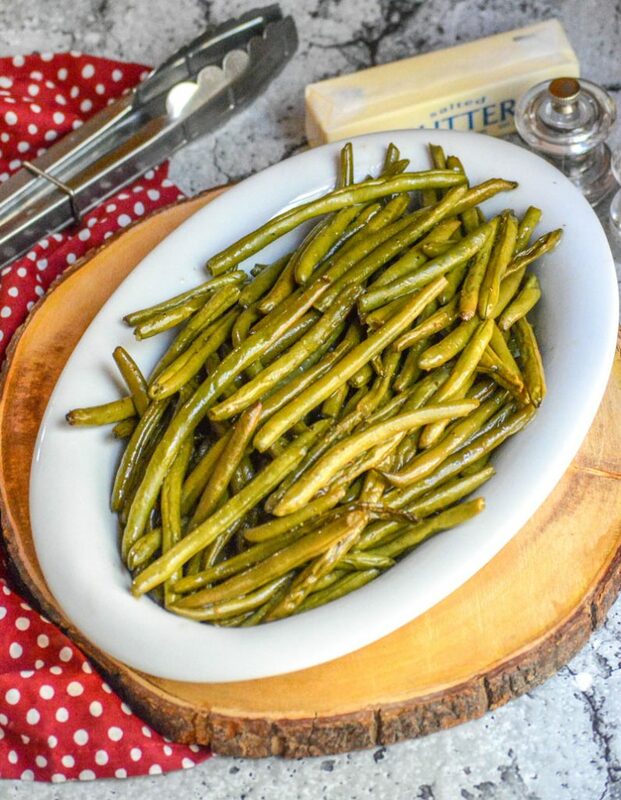 Drizzle the melted butter evenly out over the top, and using a pair of tongs gently toss the beans with the butter until well coated. Season the beans evenly, and liberally, with salt & pepper. Preheat the smoker to 275 degrees. Add the beans, and smoke 3-4 hours, tossing them every 30 minutes- or until tender shriveled, and slightly browned in places. After the beans are cooked, while still hot, but before serving- sprinkle the beans with shredded parmesan cheese. Lightly, but let it melt and enjoy! I have a Crockpot, do you use it in recipes the same way you use the IP? Thank you for bringing these to FF, wonderful idea.